IBM is a 104 year company, having 4.35 lakh employees all over the world, with a very substantial presence in India. They have their offices in Bangalore, Delhi, Kolkata, Mumbai, Chennai, Pune, Gurgaon, Noida, Chandigarh, Indore, Bhubaneshwar, Coimbatore, Visakhapatnam and Hyderabad and provide employment to around 1.3 Lakh Indians. By some estimates, IBM is the biggest IT company inside India, but, it seems that the company’s heart has shrunk lately. As per reports coming in, employees were asked to leave on the spot, their laptops confiscated by guards. Employees were seen crying and exiting the buildings with their personal belongings in hand. The axed employees broke down on receiving such treatment, from an organization they claimed to be their own. This sudden and completely unexpected move by IBM has created ripples across the IT industry, as such behavior by the management is only expected by a B-grade company, having no morals or ethical responsibility towards it’s employees. Being an ex-IBMer, I still cannot relate and accept this situation. It is being speculated that Systems Technology Group located in Bangalore is no longer required as IBM has sold off its low-end x86 server business to Lenovo for $2.3 billion. And it seems that Lenovo is preferring its Chinese workforce to carry on the operations. But still, even this logic doesn’t justify the evil treatment meted out to its existing employees. Some analysts are predicting that this year, IBM is all set to axe 13,000 employees all over the world, and out of which, 2000 employees would be axed in India. And the current incident is just the beginning. Financial health of IBM is not doing good, as in the 4th Quarter of 2013, they posted revenue loss of 5.5%. This was their 7th straight quarterly loss, and the company aims to boost its profit by doing a ‘workforce rebalancing’ act which will cost them $1 billion. Such similar rebalancing act was performed by them last year as well, when they axed some 3300 employees in North America, mainly from sales and marketing division. Financial jargons aside, there is a humane element to every business transaction. And the manner in which IBM has started its axing inside India is barbaric to say the least. I hope IBM Management understands that businesses all over the world exist to serve human beings, and not vice versa. Big thumbs down to IBM for this one! 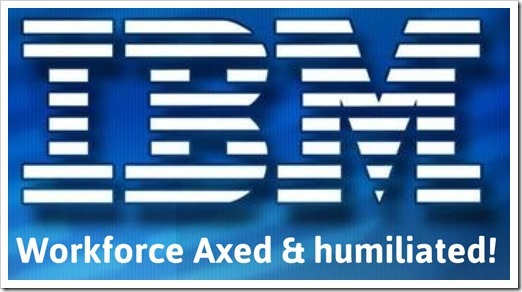 "Bloodbath Begins At IBM India; Workforce Axed & Humiliated", 5 out of 5 based on 1 ratings. Never work in a project/co where you don’t have work. Keep asking you a Q on a daily basis, irrespective of you’re getting billing/not, whether you’ve active task/work on daily/weekly basis, whether you’ve scope in that project, what you can learn from that project. If the answer to these Qs are a BIG NO, then, ask for a different project and if you’re not allowed/given a chance to move out of the project, Quit the Co. whatever big it is. Ask yourself, will you have someone like that in your co, the answer is NO, so why would we do that for our Co. I think they should have been given a 30-day notice, at the least. I have worked in MNCs (non IT) and there were policies governing hire and fire. Sometimes I thought thought MNCs were more “secure” than Indian companies as far as employment goes! Sorry to hear about all this. I’ve “joined” IBM as part of an acquisition a few years ago. Pretty much a nightmare since. For all the talk of “customer first” and such, my group seems to spend most of our time patching big time promises from sales or whomever that have totally over promised what products do. It must be an awful experience for the employees. One of the comments says that Indians have to get used to it, as Americans have! Therein lies the problem. We seem to have no mind of our own, just aping to earn a living like a piece of plastic- shine while it lasts, disposed without a thought. We have to build our ownenterprises in India.Period. Those getting the higher salaries usually manage to save their asses. Senior management of IBM India are a shady bunch. They huddle together to save their butts. I call it the band of band 10s. GBS domestic is full of them. Free loaders that can only subdue talented professionals by throwing their weight around. They are often the cause of the failure of most projects on the ground. Or try to flog crappy WebSphere products for integration. What’ll be fun is to see what happens when these blokes get axed. It will be a dog eat dog scene that would make great entertainment. A company is only as good or bad as the people responsible for managing it. IBM is a rouge company that tries to hush all the unlawful , unethical and unfair proceedings and should be banned from India for this. Very dramatic title for the article. Everybody knows MNCs are ruthless when it comes to layoffs. People signing up take the jobs for the high salaries being offered in the first place. It’s sad, but that’s just the way it is.Looking for a stable job where you never get fired? Try Govt or some of the lesser paying Indian counterparts….bet nobody will be willing to do that. IBM is “managed” by a bunch of losers. The biggest jokers start from the very top down to the band 10s and probably some 9s. The current state was inevitable. Throw in free hardware at unsuspecting businesses to entice them into so called “strategic outsourcing” contracts. Other than that IBM India is a bunch of mis-managers who have a resource pool of unfortunate techies. Everything else is done by 3 party product vendors. No one in IBM, at least in GBS Domestic “India” had, has or will have any idea about E2E architecture or how it will hang together. Anyone who joins IBM will be screwed and it doesn’t take a genius to guess the future of the company or the projects its trying to execute. The method of job cuts is even less disgusting than IBMs mode of operation, employee appraisal, ratings and the way it conducts business. itz indeed very sad the way employees were fired. But john allen has correctly pointed out how it happens in US and some other countries. But yes as pointed out by Max and RebBull, some mid-mgmt people are responsible for many delays, lethargic decisions, no good ideas, stealing ideas and presenting as if itz their own infront of higher mgmt., following useless team dynamic concepts, etc to mention few things. They are more worried abt their monthly paychecks, benefits, EMIs, 2nd house/property matters. They don’t even understand a bit of technical things. They just have a process which has been followed since ages. They stick to that. This wht i too have seen. This is life.. no one can stay in the world. Have to go one day..this is just small example. Indeed! That is why we should really rely on God and not on this world. so you rely on god and don’t rely on others for anything . GDF? Or maybe they are on their way to cloud computing which only require minimal manpower. They dont satisfy customer and as well as employees. Unnecessary GDF drama and all. IBM is one sick company, unnecessary GDF, Meetings, Login, logout, Rhythm, Blue and Jazz. They dont give what customer wants and employee satisfaction is zero . All senior managers, SVP and VPs are assholes. This is how the layoffs happen. Within hours the floor gets emptied. The management is way too lethargic and they clearly lack strategic vision I had worked there for a handful of years and found the global services unit as uninspiring. Also the one who is much closer to the management gets pampered. Its really shocking to know that IBM asked employees to leave premises in 2 hours. People those who have served the organisation for so long, atleast a company can respect the tenure and the hard work they have put in..
Companies like IBM have evolved and if this is wht they are showcasing to the rest of the world, then its really sad and disgraceful. . I am from Netsol, an IBM company, my division is running under loss for 7 years straight and management is least bothered to do anything about it. They are laying off the lower income members of the group and the leaders are pampered with promotions. Wherein the leaders should have been sacked for not strategizing a positive output of the group. There are managers in our team who are just not contributing anything for the group’s success in anyways, we have a fellow who is paid 25 lakhs for being a service delivery and support manager. This bugger does not know how to communicate, forget communication he has not brought any change in Service delivery or support till now. I can go on writing, i might have to write pages, but its no use, the management was made aware of this but they did not bother to do anything about it. This being the case how can a company be profitable? Well, I kind of Deja-Vu with Max’s comments above. We need not wonder, but real fact is well ahead of us in IBM-Netsol Bangalore premises. Meet the so called Service Delivery Manager for NOCi, who can’t speak even Elementary English. His involvement in client’s calls will only result in clint getting pissed-off & form a pitiable opinion on him & IBM, altogether !!! Not exaggerating, just meet that guy once, you will ever wonder – Oh!! For making it to a Senior & Responsible position as Delivery Head in IBM, you need not know English at all. Just use hundreds of Ok Ok Ok Ok Ok Ok Ok Ok Ok Ok Ok Ok Ok Oks.. Finish – Client call is done. Awesome, buddy..
And then, in the recent past, there was a huge escalation on a bunch group of Managers, who are notorious to occupy Meeting Rooms all the time only to chit-chat, gossip, Surf Facebook all the time, and laugh so loudly without common sense & civic sense that other resources are working, at least. These buggers are the only and only reason for all of us witnessing debacle & down fall of Network Solutions wing in Koramangala Office. Instead of sacking huge number of employees, just Axe these 6 managers of NOCi, who are only overheads on NOCi revenue. Automatically, NOCi would see some raise in performance, truly & undisputably.. Ginni, Are you listening all this, If not – Go to Hell with your IBM. In corrupt India IT sector is not governed by labor laws and does not come under its purview. All IT companies have bribed the Indian government and have got extension till 2015 or so for the Government to think and plan to include IT under labor laws. This being the status they can do what they want, its more live bonded labor. People will always be at the mercy of these corrupt till there is a revolution, which is bound to come soon in a highly populated country like India. The more jobless people become, the more they starve of hunger and other basic needs, revolution will be obvious, till such time things will go on as they are now and the corrupt will enjoy life like sadists. Couple of strong reasons for companies to fail are, 1. Manager Centric 2. Run my directors who are not founders or owners of the company. In manager centric or leader centric companies, the leaders are usually UNQUALIFIED, LAZY, VISIONLESS, UNFOCUSSED & with no knowledge of STRATEGY. Also these companies are run by group of above said people as the founders or owners are no more with the company for various reasons. IBM’s problem is the same, it is headed by leaders who eat into the earnings and not profit of the company, they are not governed by company rules which apply only to the non managers. IBM will sunset very soon if the trend follows. I guess Russia has strong labour laws for mnc employers.. At times of such layoffs the companies need to pay 24 month salary to the victims. Thats a gud practise. People have rights to equal notice period by the terms in their offer letter and principles of natural justice. Its about time people get together and legally fight for them. What is the reason behind the acculated losses ? i work for a competitive company and i have seen in the recent years that IBM loosing their long standing clients to other companies – main reasons being price quoted is too high or the quality is not as expected. In my view the reason for losses may be due to high fixed costs like indirects. Many of my freinds who work for IBM have felt that IBM has a set of employees including managerial level who don’t justify their roles or don’t have right skills. IBM has to do a root cause analysis for their losses. Being 104 year old company with its root very deep in the market & leader in the technology, is IBM unable to match with the current business world ? or a poor strategy? or the problem is with the people who run the show ? The employees in MNCs pay so much tax and there is no help extended from the government. This is sad. I am ok with this treatment, if companies accept and allow the same behaviour from employees. An employee resigning, getting releiving and experience letter within two hours without any KT for workdone by him/herself. Why serving notice period is only for employee not employer? If there is a reason for such ousting of 200 employees I am eager to know what it is. I have worked with this organisation for 5 years. I know they werent good paymasters but atleast there was some respect left for them. I have seen its decline from 2003 to 2008. But this is the final nail in the coffin. I seem to recall that there was the very opposite of outrage in India when IBM was laying off thousands of US employees. At least in the case of these recent layoffs in India there is some justification (though it doesn’t make it any less painful) – IBM sold the business unit to Lenovo. I feel bad for anyone who loses their job without cause, however I find some of the dramatic language being used in the Indian press about this somewhat hypocritical given the glowingly positive language the Indian press used about all the US employees losing their jobs so their jobs could be moved to India. Now you see first hand the human toll that IBM’s mass layoffs in the US several years ago had. I do honestly hope and pray that everyone in India who lost their jobs are able to find new jobs quickly. My sincere best wishes to the employees and their families who are affected by this layoff. It’s an awful thing to have happen no matter who it happens to. Well said ReaganHalf. Job cuts anywhere are emotionally painful, traumatic and disorienting. The article has been written by an ex-IBMer so am assuming the author would have heard first-hand about the treatment meted out. I believe axing calls for sensitive treatment which seemingly was missing in this case. Shibendra, it is not 50 employees. Just confirmed from someone who was working for STG group. An entire floor of about 200 people was let go..thats the accurate figure.. While I agree the manner in which these people were dismissed is callous at best, as an American I can tell you this is standard practice, and the kind of thing many Americans went through when jobs were first being outsourced to India. These MNC’s have NO loyalty to anyone but their stockholders. Unfortunately people invest themselves in these companies thinking it is reciprocated. I feel bad for the workers as I know from bitter experience exactly how they are feeling. Yes John…I am aware about it… It is pretty much the way it happens in the USA when you get fired. But in India, it’s very rare for something like this to happen. It is ok with one-off individual, but such mass firings are really unheard of.. and thats why such an hue and cry about it! @ Arun…, get used to it, when people of USA is suffering till today and being US company why can’t we? its not an Indian company anyways. The job cut was not to make more money instead to create opportunity for human beings else where (China). Eg.. you will ask your home maid to leave the job when you can’t afford anymore will you bother about his/her life, family or children and do you think you became inhuman? its simple business logic. We were prepared to grab the opportunity when it was available now we should learn to lose it as american’s being doing so long. While the method of retrenchment was harsh the reality is that layoffs is a common feature of working life. To expect that corporations offer a lifetime employment roadmap or there will be job security for life is living in a delusional world. No company can afford or will give employees a sinecure for long term stability in their jobs. The Indian IT market has been coasting on high expectations of life time growth opportunities. the earlier employees and job seekers realize that instability in part of industry norm the better off they will be. Turbulence and Change is coming to the industry and this announcement is a precursor to jobs and employment instability in this industry. IT jobs will not have job security and unionization as a panacea will not address the issue because these jobs will move. Indian IT companies maybe coerced into but they will become uncompetitive. That’s not the point. It’s the suddenness, and harshness with which they were let go. It’s not possible to guarantee lifelong employment… but it’s certainly possible to be nice about it and soften the extremely harsh blow that job loss is. 2 hours? What could they have possibly gained? If so, where’s the proportionally (positively) shocking severance pay? This is how firing is done everywhere. I know cases where people have not been allowed to go back to their desks after being told they are fired. That doesn’t make it right, or any less painful for the people going actually through it all, but, there is a reason why people are fired the way they are.